Execute on S.M.A.R.T. goals with project management in Smartsheet. Do you get overwhelmed at the beginning of a project? 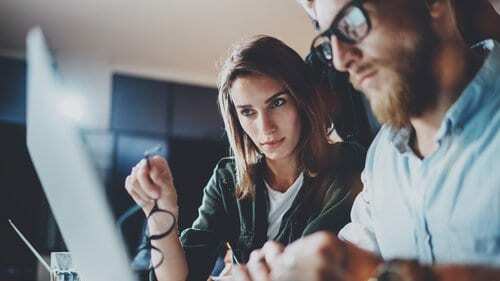 Do you struggle to boost team productivity? The secret to alleviating common project challenges is to set specific goals. S.M.A.R.T. goals are designed to provide structure and guidance throughout a project, and better identify what you want to accomplish. This method is especially effective in helping employees set goals that align with company initiatives. In this article, you’ll learn what S.M.A.R.T. goals are and how to write them. You’ll find multiple examples showing you the process, and templates to help you get started tracking and managing team goals and objectives. We’ve also detailed how to execute on your S.M.A.R.T. goals with real-time, collaborative project management in Smartsheet. What Does the S.M.A.R.T Acronym Stand For? S.M.A.R.T. goals are a relatively new idea. In 1981, George T. Doran, a consultant and former director of corporate planning for Washington Water Power Company, published a paper called, “There’s a S.M.A.R.T. Way to Write Management’s Goals and Objectives.” In the document, he introduces S.M.A.R.T. goals as a tool to create criteria to help improve the chances of succeeding in accomplishing a goal. When it comes to writing S.M.A.R.T. goals, be prepared to ask yourself and other team members a lot of questions. The answers will help fine-tune your strategy, ensuring the goals are something that’s actually attainable. While you should be as realistic as possible, it’s important to approach writing S.M.A.R.T. goals with a positive attitude. After all, this is something that you want to achieve. This doesn’t have to be a daunting experience; in fact, it should be quite illuminating. Later in the article, we demonstrate how to write S.M.A.R.T. goals for two typical business scenarios: completing a project and improving personal performance. Below, we’ve included an easy-to-use S.M.A.R.T. 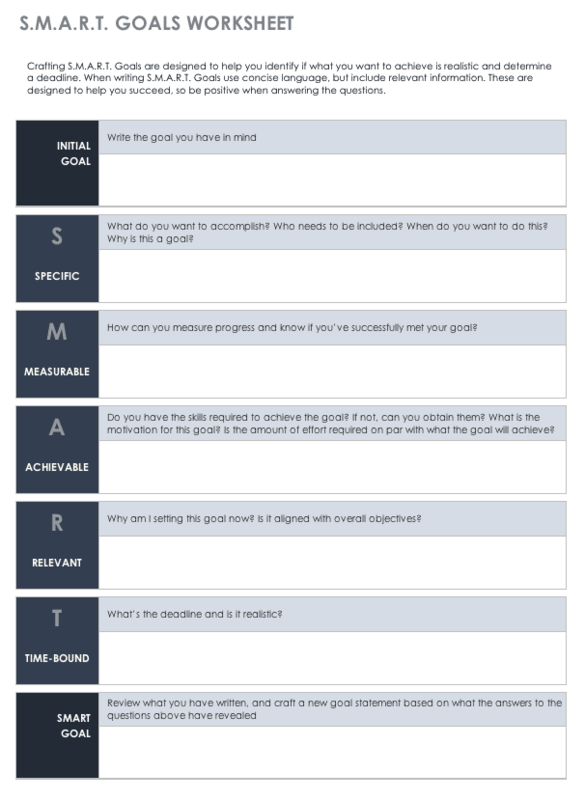 goals template in Word, along with a template to help you plan and manage your goals in Smartsheet. Once you’ve defined your S.M.A.R.T. goals, it’s essential to put a plan in place to achieve them. To help with execution, you need a tool that enables you to plan, track, manage, automate, and report on your goals in real-time. One such tool is Smartsheet, a work execution platform that enables enterprises and teams to get from idea to impact - fast. With a collaborative, real-time objectives tracker in Smartsheet, you can increase transparency and improve accountability across your initiatives. 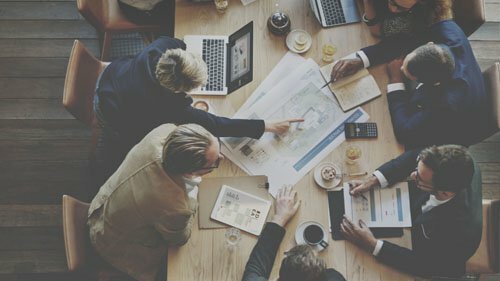 Plus, top project management leaders rely on Smartsheet to help align the right people, resources, and schedules to get work done. 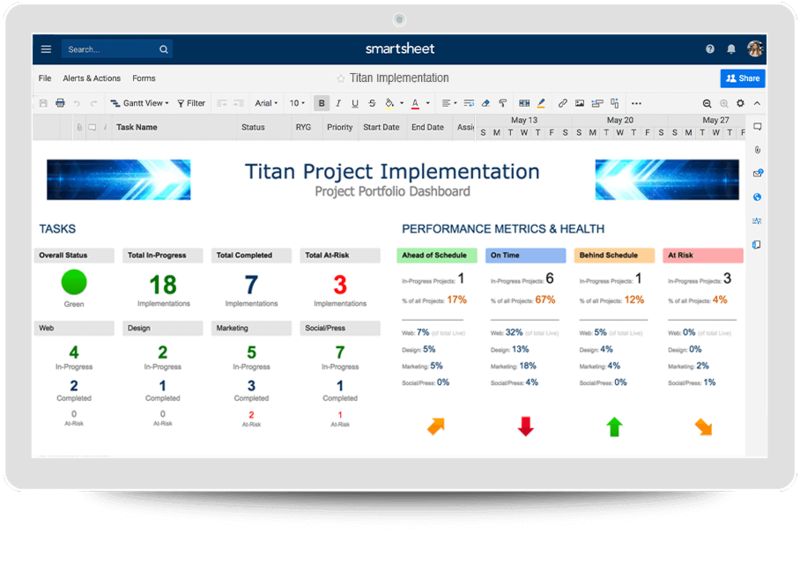 Use Smartsheet to create consistent project elements, increase speed, and improve collaboration with scalable options that fit individual work preferences. Hold yourself and your team accountable, improve visibility into team priorities, and ensure nothing slips through the cracks. Discover how Smartsheet can help maximize your project management efforts, today. This is a typical approach to creating goals, but both of these are very vague. With the current wording, the goals probably aren’t going to be attainable. The statements lack specifics, timelines, motivation, and a reality check. Now, let’s use the S.M.A.R.T. goals formula to clarify both and create new and improved goals. Specific: Many people are accessing our current site from their mobile devices. Since it’s not a responsive site, it provides a poor experience for customers. I want to launch a mobile app for my company website by the end of Q2, which requires involvement from software development, design, and marketing. Measurable: Creating a mobile app for our company site will require a lot of resources. To make it worthwhile, I’d like to have 50,000 installs of the site within six months of launch. I’d also like to show a 5% conversion rate from customers using the mobile site. Achievable: The departments that will be involved have signed-off on creating a mobile app. I’ll need to manage the project and set milestones to keep everyone motivated and on target. Relevant: Improving the customer experience on mobile devices is a core initiative for my company this year. Time-Bound: In order to achieve 50,000 mobile app installs and a 5% conversion rate by the end of the fiscal year, the app will need to be launched by Q2 with a robust marketing campaign that should continue through the end of the year. Specific: I received low marks on my ability to use PowerPoint at my last performance review. Improving my skills requires that I learn how to use PowerPoint efficiently and practice using it by creating various presentations. I’d like to be more proficient using PowerPoint in time for my next review in six months. Measurable: By the time of my next review, I should be able to create presentations that incorporate graphs, images, and other media in a couple of hours. I should also be able to efficiently use and create templates in PowerPoint that my coworkers can also use. Achievable: Improving my PowerPoint skills is instrumental in moving forward in my career and receiving a better performance review. I can set time aside every week to watch PowerPoint tutorials and even enroll in an online class that can teach me new skills. I can also ask coworkers and my manager for PowerPoint tips. Relevant: Working with PowerPoint is currently 25% of my job. As I move up in the company, I’ll need to spend 50% of my time creating PowerPoint presentations. 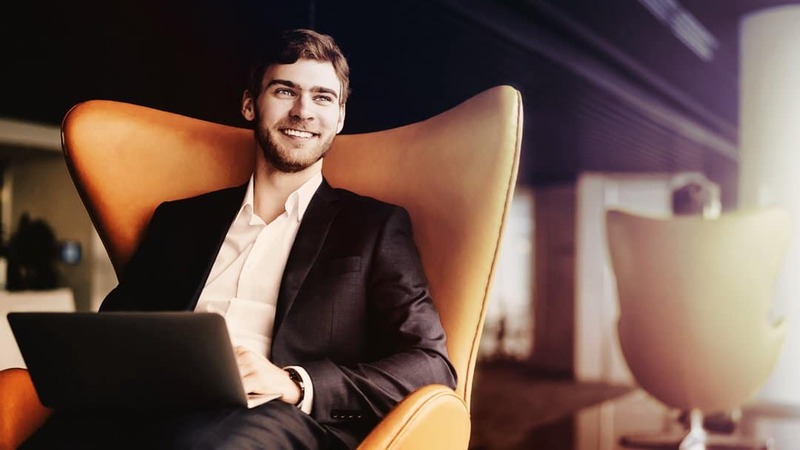 I enjoy my career and want to continue to grow within this company. Time-Bound: In six months, I should be proficient in PowerPoint ensuring it only occupies 25% of my workload instead of the nearly 40% of the time it occupies now. Description: Improving the customer experience on mobile devices is a core initiative for my company this year, so we are going to create a mobile app. By the end of the fiscal year, there should be 50,000 installs of the mobile app we develop, and it should produce a 5% conversion rate. We’ll build the mobile app in-house and launch it by the end of Q2 with an app-related marketing campaign that will continue to the end of the year. Milestone: Mobile app launches end of Q2. Deadline: End of the fiscal year. Description: To grow in my career, I need to improve my PowerPoint skills. By taking online classes and reviewing tutorials, I’ll improve my PowerPoint skills so that it only requires 25% of my work time. Milestone: Complete an online PowerPoint course in three months. Deadline: Next employee review in six months. Discover more project management tips, template, and best practices in our comprehensive Project Management Guide.